Get the Funk Out! : Laura Schroff, #1 New York Times bestselling author of "An Invisible Thread Christmas Story," joins me Monday at 9:00am! Laura Schroff, #1 New York Times bestselling author of "An Invisible Thread Christmas Story," joins me Monday at 9:00am! Did you miss Laura Schroff on today's show? In her New York Times bestselling book An Invisible Thread, author Laura Schroff tells the remarkable story of her lifelong friendship with a boy named Maurice who she met on the street while he was asking for spare change. Now, in this sweet picture book, Laura retells the story of the first Christmas that she and Maurice spent together. She shares how Maurice gave her a stuffed white teddy bear with a red heart, the only thing he had that he could truly call his own—to show her how grateful he was for their friendship. This heartwarming tale captures the true meaning of the holidays and will be one you’ll want to share with your family year after year as a reminder that a gift from the heart is always the best present under the tree. Laura Schroff is a #1 New York Times bestselling author and keynote speaker. 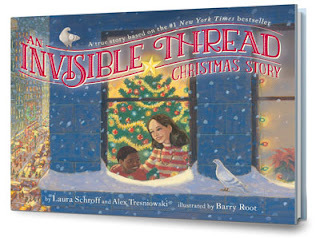 Laura’s second book, An Invisible Thread Christmas Story children’s book will be released on September 22, 2015. Since the launch of An Invisible Thread , Laura has been an invited keynote speaker at over 100 events. Over her thirty-year career in advertising sales, Laura has worked with several major media companies, including Time Inc. and Conde Nast. Born and raised on Long Island in New York, Laura was part of the advertising team that helped launch and make USA Today a successful national newspaper. Before helping launch three of the most successful start-ups in Time Inc. history—InStyle , Teen PEOPLE , and PEOPLE StyleWatch—she was also the New York Division Manager at PEOPLE magazine. Laura has also been the New York Ad Manager at Ms. magazine and the Associate Publisher at Brides. Laura is dedicated to sharing her An Invisible Thread heartwarming story on the power of small acts of kindness all over the country. Laura lives in New York City with her feisty poodles Coco and Emma. Alex Tresniowski is a writer living and working in New York City. He was a senior writer for PEOPLE magazine since 1998 to 2012, writing dozens of cover features and hundreds of stories focusing on human interest, crime and sports for a weekly readership of 44 million. 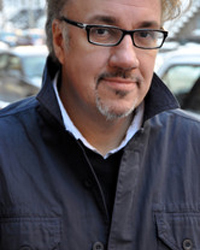 He is also the co-author of several books, including 2011’s An Invisible Thread, which won a prestigious Christopher Award, 2005’s THE VENDETTA, a true crime story that was purchased by Universal Pictures and used as a basis for the 2009 Johnny Depp movie Public Enemies. Photo credits: Ralph Baleno Studio (Laura); Lorraine Stundis (Alex). An Invisible Thread is the inspiring true story of Maurice and me. We met on 56th street in Manhattan in 1986, when I was a 35-year-old single, successful ad sales executive, and he was an 11-year-old homeless panhandler. He asked me for spare change; I said no and kept walking. But something made me stop, and turn around, and go back to him, and that day I took him to lunch. We met the following Monday, and every Monday for the next four years, and hundreds of times after that. Almost 30 years later, we are still great friends. An Invisible Thread is the story of how we changed each other’s lives forever. The impact of our meeting is resonating far beyond Maurice and me. Today, An Invisible Thread has become a required read in many schools and is being taught in high school and college classrooms around the country. Additionally, An Invisible Thread ELA Common Core Standards Curriculum Guide has been developed. An Invisible Thread is available in multiple languages and formats and film rights have been purchased by OddLot Entertainment.